Crunchy. Toasty. Creamy. Heavenly. 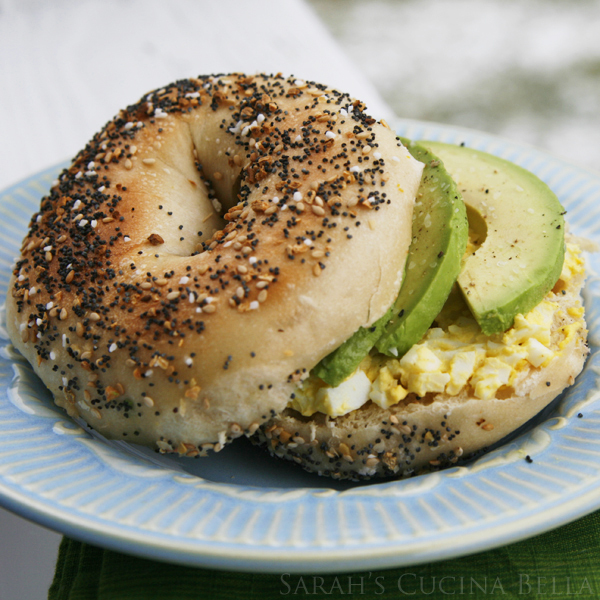 This Avocado Egg Salad Everything Bagel Sandwich is so many wonderful things. Add to that list comforting, mouthwatering and OMG-good. But don’t for one second think that this would be as good without the everything bagel. It wouldn’t. I mean you need that salty, onion-y, sesame and poppy seed goodness to bring more crunch and dimension to the sandwich. And don’t dare skip the avocado. It’s just not the same without it. This avocado egg salad sandwich is something simple. Really. But it’s the sum of the parts that matters. Kind of like a community. It’s not about one person, but about the whole. The collective goodness. In our small town, everyone knows each other — or knows someone who knows each other. At a party this past weekend, I started talking to a mom of a boy in Will’s class and learned that not only does she live one street over from us, but she’s friends with my neighbor. It’s the smallest of small towns. This matters. Being in a town where a trip to the grocery store inevitably means running into someone that I know is something I’ve struggled with over the years. In many ways, I like a certain degree of anonymity. But when push came to shove in the last few months, I realized how incredibly blessed we are to have such a strong community. We’re all here. We’re in this together. And though those whose kids weren’t there that day don’t share the same stress, anxiety and trauma that the families in our school do, we all share in the grief, horror and resolute passion that we will come out better for having survived this. Being part of a community is an important thing. It’s not about knowing that there’s one degree of separation between you and just about everyone else. It’s about knowing that when the going gets rough, you have a community of supporters just waiting to pick you up, brush you off and remind you that there is goodness in this world — and we will be okay in the end. Meanwhile, smash the egg with a fork. Stir together with the mayo, salt and pepper. Spread onto the bagel. Top with avocado. There is most definitely something very comforting about a small town with a strong community. I thought an everything bagel could not be topped with anything other than cream cheese, lox, capers and red onion, but this looks delicious and is going on my ‘how to eat more avocados in 2013’ list. I love everything about this!!! I’m obsessed with everything bagels and avocado & egg salad? you can’t get much better than this. Community is so important!! xoxo to you and your community! Thank you, Julie! I don’t think I ever realized how much community matters — until I really needed it. You didn’t say what happened in your community but, hope everyone is doing better. 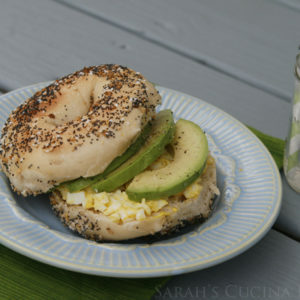 About the avocado/egg on bagel…I have to say…yum but, lots of fat and white flour. I have eaten this way so many times and called it healthy till I learned more about whole foods. Now a couple slices of avocado is a treat and I almost never eat flour foods, and no oil. When I do, it’s flour made from non gluten sources and, again, a treat. Not eating eggs any more. Sounds like, “well, what do you eat?” Everything! I and my friends have no end of wonderful food combos and oh yeh. I’ve lost 80 lbs.